Veteran ESPN broadcaster Dan Shulman will serve as the play-by-play voice calling the World Series on ESPN Radio. He joined us for five questions prior to tonight’s Red Sox-Dodgers Series showdown. Q. Who do you trust more: Clayton Kershaw and his questionable career postseason record or Chris Sale and his questionable health? A. As good as this matchup is, it’s kind of a shame it’s not a slightly younger Kershaw against a healthier Sale. On any given night both are capable of pitching a great game. They’re both ultra competitive and still ultra talented even though they may be dealing with something here and there. I trust both of them equally. If it doesn’t go well for one of them, it’s because they made a couple of mistakes or the other team put some good swings on them. Sale’s going to compete his tail off, we know that. And Kershaw was great in Game 5 of the NLCS and had a good inning in relief in Game 7. They’re both likely to go out and have pretty good outings out here tonight. Q. How do the Dodgers win the Series? A. Kershaw’s got to pitch well. Another guy who jumps out at me is Walker Buehler who will start Game 3 and presumably start Game 7 if it goes that far. He’s a rookie but his arm is spectacular. He’s going to be one of the best starting pitchers in baseball for a number of years. If he can harness his adrenalin and throw strikes, he can compete with anybody. Walker Buehler pitching well is one thing that would do it. Someone who’s always been kind of a wildcard is Yasiel Puig who could have been MVP of NLCS against Milwaukee. He had some very big moments and very big hits. If he plays up to his potential, that’s another thing. An underrated aspect of the Dodgers is that was really big for them in the NLCS was the performance of their bullpen. Kenley Jansen looks like he’s back to being as good a closer as there is in the game. If guys like Ryan Madson, Pedro Baez, Kenta Maeda, and Julio Urias – quietly they all had big moments for the Dodgers in the NLCS and if the Dodgers can control the seventh and eighth innings in the series, they’ve got a chance. Q. Is this Boston-LA big payroll matchup good for baseball overall? A. These things happen from time to time but we had Kansas City in the World Series in 2014 and ‘15. It goes in different directions but obviously the big payroll teams start off with an advantage. But this is a really compelling World Series matchup. I’m thinking about this Series more in terms of ballparks and passion and fan bases and histories and those sort of things. It’s East Coast vs. West Coast, there are Red Sox fans and Dodgers fans all over the country, and of course Boston-LA makes you think of NBA before you think of MLB. But the fact that these two franchises have only faced each other in the World Series once before over 100 years ago is really cool. Q. Would you play Mookie Betts at second base in LA? A. It depends on who the starting pitcher is. If it’s a lefty for the Dodgers – which figures to be Game 4 and 5 — then you’re not as motivated to do it because let’s say Jackie Bradley didn’t hit lefties much at all all year so you can leave Mookie Betts in the outfield and you can put Ian Kinsler or whoever you want at second base. I would be more motivated to do it in Game 3 when Walker Buehler is starting because then you have another left-handed bat on the bench. I know it’s been talked about a lot but I don’t think it’s going to be that big of a storyline in the World Series. Q. Jackie Bradley Jr. emerged as the surprising Red Sox X-factor — and ALCS MVP – against the Astros. 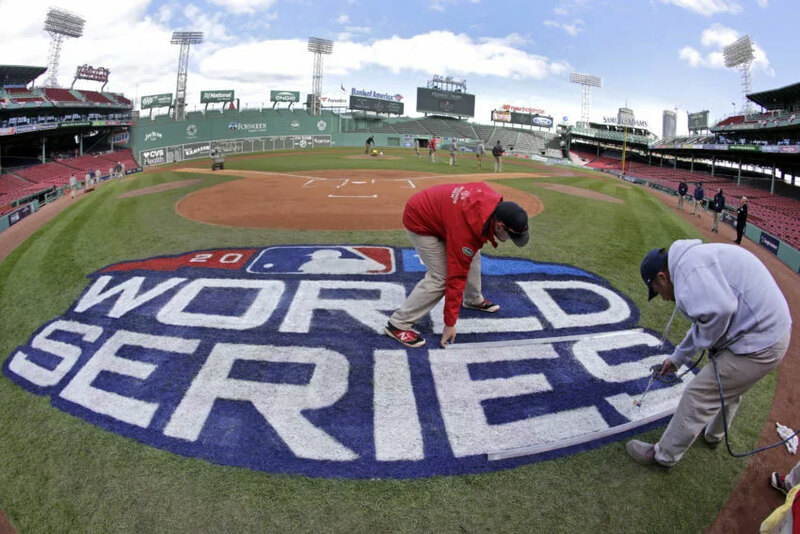 Who’s your pick to steal the spotlight from the superstars in the World Series for Boston? A. It’s funny, never has a guy made more out of three hits in five games than Jackie Bradley, Jr. did. But it’s all about your timing, and men on base, and driving in nine runs and all that and I was happy for him because he had a slow start to the season then he came on in the second half and really worked hard and he’s a great defender and it’s nice to see guys do that. One guy to really keep an eye on for the Red Sox — again because lefties would most likely start five out of a potential seven games for the Dodgers – is Steve Pearce. He’s a guy who really interests me — being from Toronto and calling Blue Jays games as well, so I’ve seen him a lot. During the regular season and the one home run he hit in the postseason have come at really big moments and he’s a good hitter and he’s not going to be scared by the moment or anything like that. He’s going to get a lot of at-bats in this Series.